As reported by earlier in my blog dated 28.1.2013, the Apple has gone ahead and launched the storage boy iPad with whopping 128GB of memory. At this moment, as I write, the first pieces of this storage boy are being shipped in US to be available to users within 3 days. 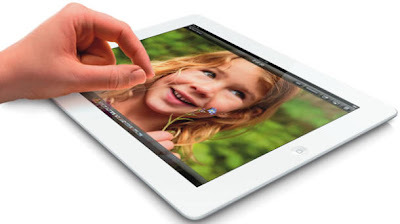 The 128GB iPad which was announced just last week, by Apple, is identical to the fourth-generation iPad that Apple launched last year, except that it has double memory. So obviously, as the memory has doubled so has the price. Apple's 128GB iPad starts at $799 for the Wi-Fi-only model, and those who want cellular connectivity will need to pay $929. As of now the 128GB artifact is available only in USA with AT & T network with Sprint and Verizon to join the party in next two days. This move was expected from Apple as its stock has been taking a hammering since announcements of Samsung's global surge had cropped up. This was despite the fact that Apple had shipped record iPhones and iPads in last year. Though the storage capacity of iPad has been doubled, the price increase is about $100.00 more than 64GB version, so I would caution the readers to wait till the euphoria has died down. At a later date, say in June 2013, it will become cheaper option to owning a full blown Mac.